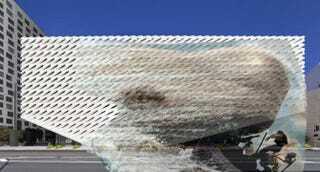 Photoshop Contest: What Does LA's Newest Museum Really Look Like? Locals have taken to calling it the Cheese Grater, but there’s so many more things that the new Broad Museum’s wacky facade evokes. A sponge. A giant Jambox. A celebrity whale. Now it’s your turn to tell us what you see. The fiberglass-reinforced concrete shell that encases Eli Broad’s art museum is made from over 2,500 panels, which create a honeycomb-like texture that might resemble the holes in a grater. But one problem with calling it the Cheese Grater is that there’s already a building in London nicknamed the Cheese Grater which actually looks far more like an actual cheese grater. Come on people, we can do better. Use this photo (or another of your choosing) to show us what The Broad looks like to you, and, as a bonus, propose your own nickname. Also, to our tryptophobic readers, let us know: Do you see death and decay? Deadline is Monday morning, 9am ET. The museum opens to the public tomorrow.